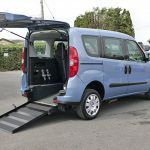 This wheelchair accessible vehicle has been converted by Gowrings and has a very generous ramp at the back with a width of 33 inches – great for a bigger wheelchair and a very easily accessible vehicle. 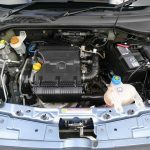 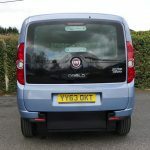 A 1.4 litre petrol engine and manual gearbox with wing mirror indicators and front fog lamps – a full list of features can be found under the specification section on this webpage. 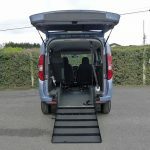 The conversion is very neat and as you will see form the photographs we have included on this page, they have even included a fixing at the rear to place the back wheelchair restraints when not in use. 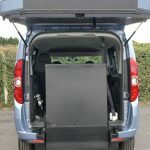 As far as storage goes, you also have the benefit of an overhead storage shelf in the front which is an ideal area to place any valuables out of sight and for keeping the vehicle nice and tidy when travelling around. 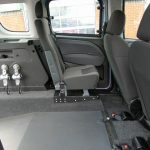 The rear seat can also double up as somewhere to place any essential items required by the user of the wheelchair. 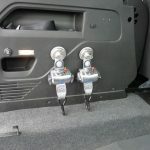 The inertia belts at the front of the wheelchair location have a no roll back function making it safer when pushing the wheelchair user up and into vehicle. 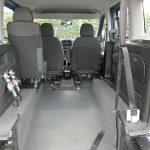 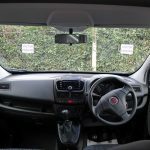 Once inside, and all wheelchair restraints and safety belts fastened, the wheelchair user can rest assured that they are both safe and secure when travelling out and about. 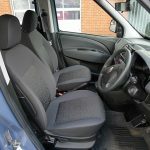 Air conditioning is also a feature and this ensures that all passengers can be kept nice and cool on those warmer days (remember Summer of 2018!) 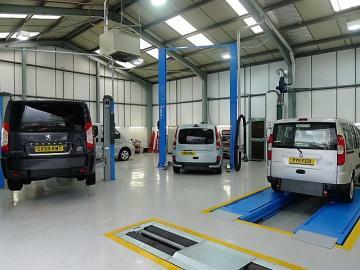 and longer journeys. 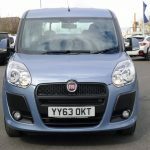 A great compact WAV to own that can be delivered to your door by one of our friendly drivers (free delivery to all UK Mainland addresses). 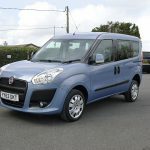 If you would like to know more about this Doblo, please give us a call on 01824 707773.